At first you will receive a preliminary information on "Delivery date and shipping costs" for the selected single product on the product configuration page. On the shopping cart basket, the final setting of the delivery date and shipping takes place for the entire contents of the cart. At the beginning, the delivery time is always displayed in the "Standard" for postal code 10001 (Germany). Here you have the possibility to change the country and the postal code depending on the desired delivery address. The delivery time can also be changed. The shipping costs are calculated on the basis of the product weight. In the case of single, very large products, deviating shipping costs may occur due to the ration of weight to volume. These deviations are shown in the shopping cart. These include e.g. seat cube, seat cylinder, seat bags, large floor elements, sunshades. Please note that a change in the delivery time also leads to a change in the product price because of the newly determined production time. 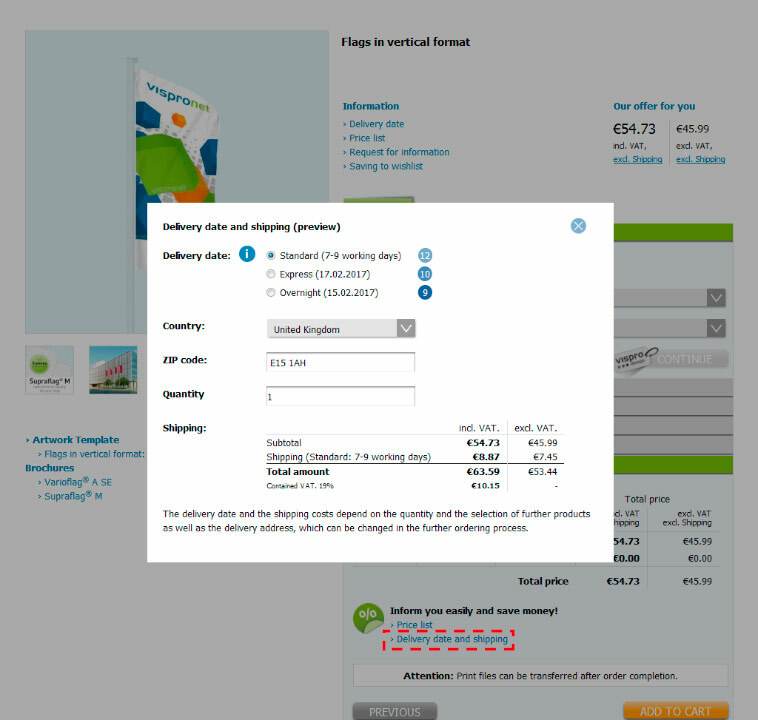 The shipping costs consist of the packaging costs (not inclueded in the product price!) and the external transport costs. 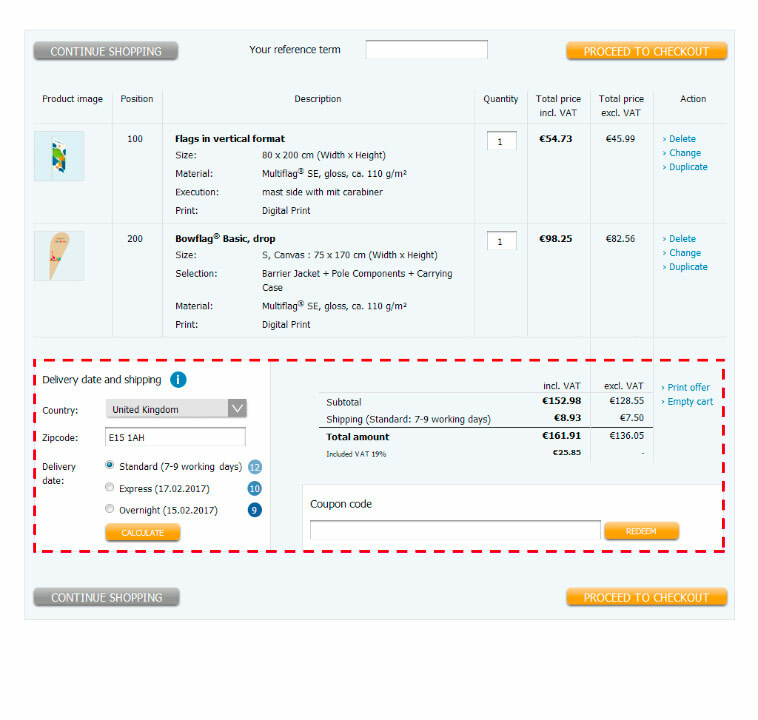 The complete delivery of the shopping cart content with several order items in one shipment results in a reduction of shipping costs. That would not be possible with single shipping! In case of deliveries to different addresses the shipping costs per address will be charged. The shipping takes place in dependence on the quantity, weight, volume and delivery address with UPS or freight forwarder. In addition to the shipping costs a service charge of 5.83 € incl. VAT (4.90 € excl. VAT) per address will be charged. This service is not possible with delivery times Express and Overnight! Please note that custom duties, taxes and charges may be applicable for deliveries to EU-countries or to non-EU countries. Please note that there may be some deviations in the delivery date for shipments to special areas (e.g. mountain, islands or some postal code areas). Please contact us before ordering.